The world championship matches in Moscow took place at the VTB arena, the new ice palace built on the territory of an old ZIL factory. The Ice Hockey World Championship in Moscow and St. Petersburg came to a close on May 22 with victory for Canada. RBTH visited the fan zone in Moscow during the tournament and found out how it will be remembered. 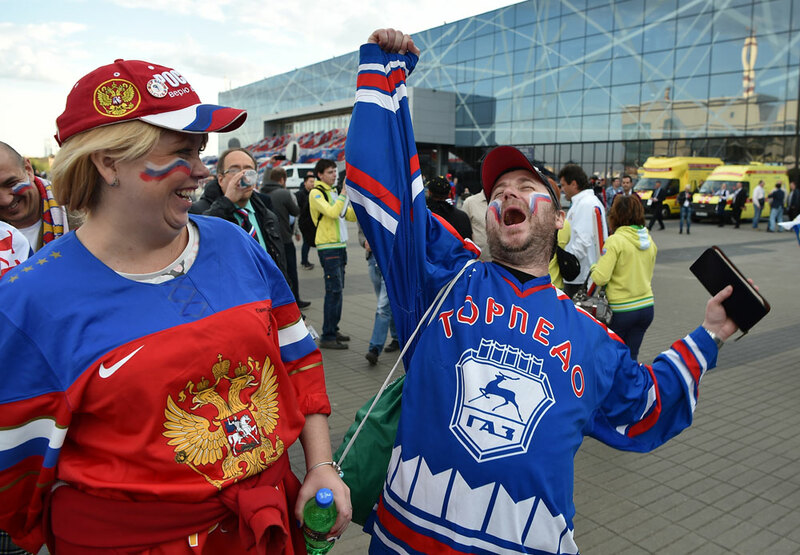 Despite proclaiming themselves happy with the organization of the Ice Hockey World Championship in Moscow and St. Petersburg, many hockey fans who came to Russia for the tournament were left disillusioned by the prices, which they saw as unacceptably high. The Ice Hockey World Championship took place from May 6 to May 22 in Moscow and St. Petersburg. For Russia this is the third world championship after 2000 and 2007. The USSR hosted four world championships. For the U.S. national team fan Bruce Kendall the current world championship was his 25th. The 60-year-old says that the last three ice hockey championship – Minsk (2014), Prague and Ostrava (2015) and Moscow and St. Petersburg (2016) – have changed his perception of the organization. According to him, service and navigation have become very convenient, the fan zones are now more entertaining, the souvenirs and food courts more diverse, and the personnel friendlier and more responsive. However, Kendall, who also visited Moscow for the World Championship in 2007, said that pricing for games was a disappointment. “The costs on hotels and food are allowable because of currency fluctuation. The only thing I was disappointed in was the ticket prices. We bought official tickets for the game against Russia in the group stage via the internet in the top row for 7,000 rubles [$105]. Even for us this is expensive." However, he echoed Kendall’s criticisms of the pricing strategy for the tournament, declaring himself less than thrilled with what seemed exorbitant costs. “The prices unpleasantly surprised me,” he said. “Compared to Minsk, everything in Russia is much more expensive – from beer to merchandise. For a tiny magnet in an official shop I paid 600 rubles,” Tickets also cost me an impressive amount. “For the match against Russia in the quarter-finals, I bought a ticket for 12,000 [rubles, $180]. In the group stage of the game in St. Petersburg tickets were cheaper – by four and a half thousand – but it is not cheap. I can’t imagine how fans from the Russian provinces can afford such a treat." Ladislav Klima, who travelled to Russia to support the Czech Republic, praised the arena in Moscow and the ample leisure opportunities, but also made clear that this year’s tournament had failed to live up to Minsk 2014 and complained about high prices. The world championship matches in Moscow took place at the VTB arena, the new ice palace built on the territory of an old ZIL factory. The 12,000-seat multi-functional arena opened a year ago, becoming the home rink of the Dynamo Moscow club. In December last year the arena also hosted a large boxing event – the match between Roy Jones and Enzo Maccarinelli. It took two years and about 4.5 billion rubles ($676 million) to build the arena.